We canâ€™t allow folks to avoid the greats. Do we want a fearful, disengaged student to read literature? Lots of folks say that itâ€™s irrelevant whether the students like the literature. Teach a college course in graphic novels. Even after years of graduate school as â€œreading should never be funâ€ comics let us connect. Interdisciplinary approach, using graphic novel. Teach an open-ended course, wanted to teach revenge tragedy. 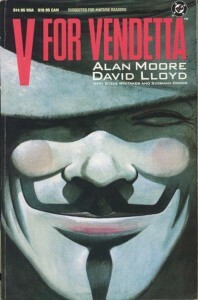 Read V for Vendetta. Watched the film. Stumbled upon a way to teach all my loves. Oppression, darkness, sense of impending doomâ€¦. This was after only a few pages after reading the comic. Chose V for Vendetta, first lines are from Macbeth. None of them had ever read Macbeth. Sent them home to read the play and look for the lines. Hip-hop song about Hamlet was brought to me. What if students never read the original text? It does not matter. Students learn the story and able to speak intelligently about it.